Many, many moons ago I used to love to play dress up! the super sweet image called Dress Up Avery from Paper Nest Dolls. was colored with the following Copic markers. The flowers were created with .6mm white Foamiran. I used the three smallest dies from the Lady E Design Flower 001 Cutting Die Set for my flowers and colored them with a little ink from my stash before heating them. Once I had heated and manipulated each layer it was time to assemble the flower. I added 3mm double headed pink pearl stamens to the centers...gorgeous!! 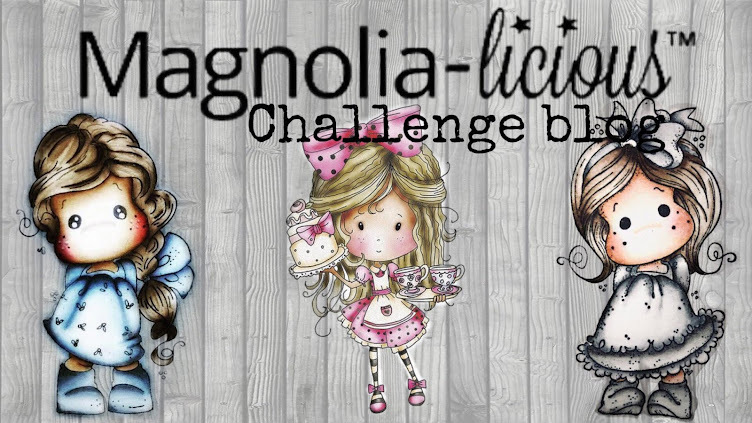 Remember to join in the fun and enter your projects in the Magnolia-licious challenge. We would love to see your creations. As always, you can find an abundance of gorgeous inspiration for sale in the store here. Feel free to visit my blog for lots more inspiration here. 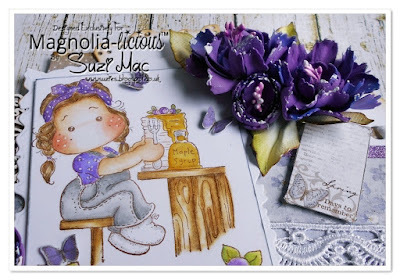 Today I have another inspiration card using the very sweet Breakfast At Tilda's stamp set exclusively designed for Magnolia-licious Stamps, Dies and So Much More store. 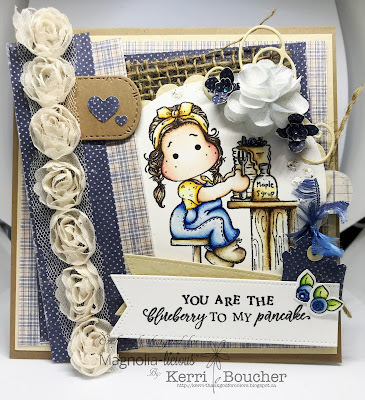 I know I just used this stamp for my last post but she's just so sweet and I wanted to make another. 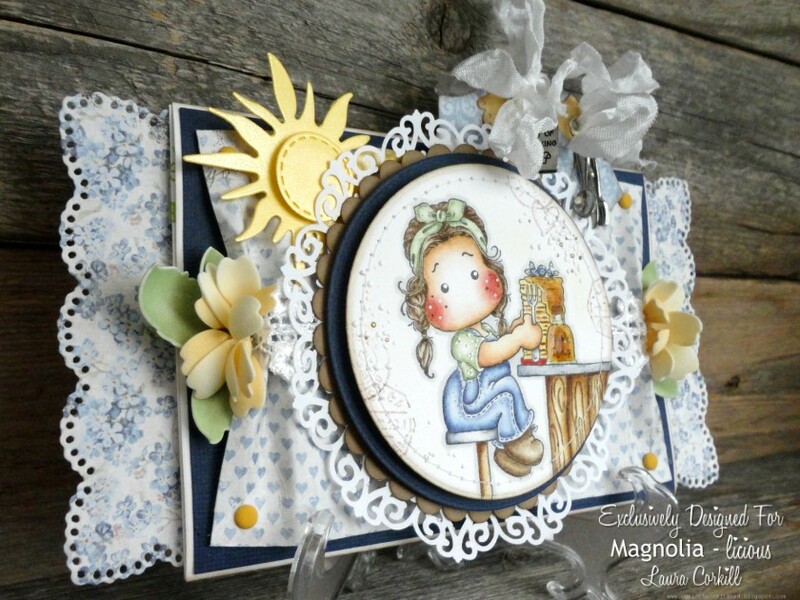 So here she is again, Breakfast At Tilda's by Magnolia of Sweden made especially for Magnolia-licious. I have colored her with Distress Inks which I still need much practice with. 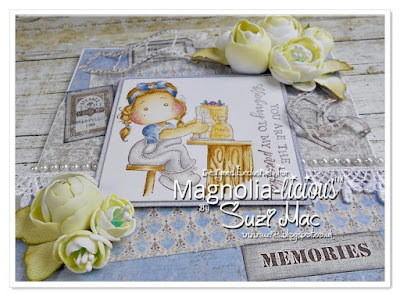 Lots of gorgeous Magnolia DooHickeys Dies have been used here, some old and some not too old. I love them all and it can be so hard to choose which ones to use. I do have my certain ones that I use almost all the time though, such as the Rose Leaf and Tilda Tag. Here I've included the Bloomy Tag, Heart Tag, Oven, Honeycomb (DooHickey Club #10) and these beautiful Berry Branches (Vintage Box # 4). The flower is made of Foamiran and cut with Lady E. Design dies. 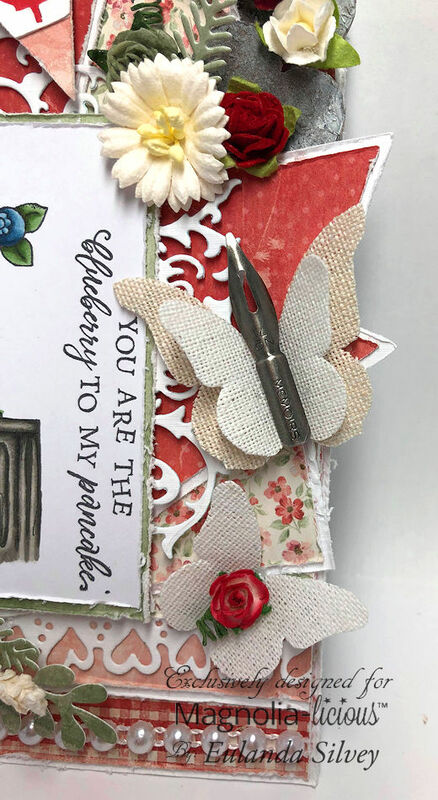 Distress Inks: Aged Mahogany, Antique Linen, Brushed Corduroy, Bundled Sage, Chipped Sapphire, Fired Brick, Peeled Paint, Tattered Rose, Vintage Photo, Walnut Stain. That's it for me. Thank you so much for stopping by and taking a look. I hope you have a great day and a wonderful weekend. 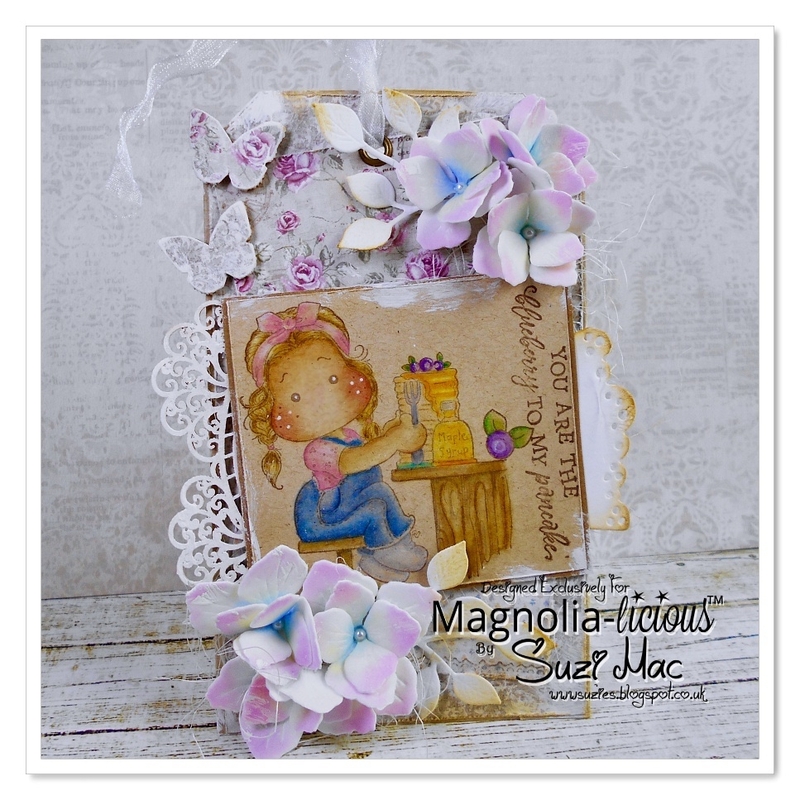 Magnolia-licious Store and added her to a chipboard tag. like to see her amazing skill level. to win a $20.00 gift certificate to use in the Magnolia-licious Store. you enjoyed your stay and do please come back and see us soon. I am very excited to share an exclusive stamp made from Magnolia for the store. This was something that I have always wanted to do for all Magnolia lovers around the world. 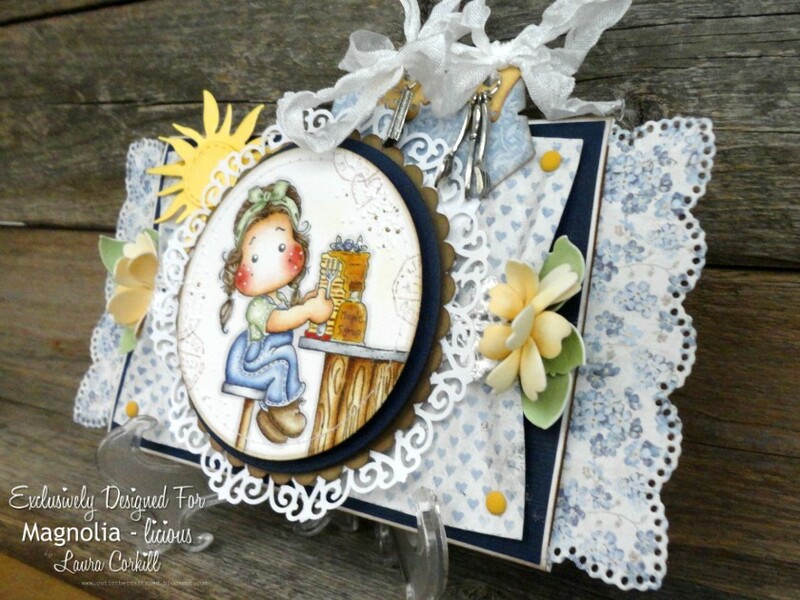 I thought about creating this stamp and Pauline made it come alive. 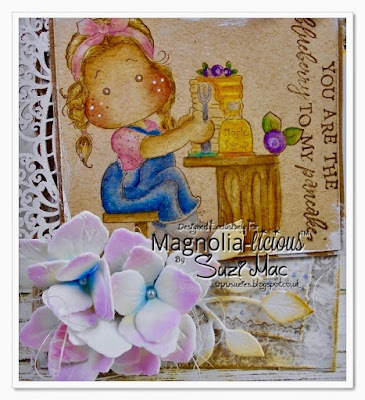 I hope you love it and that it would be a wonderful edition to your personal Magnolia collection. There will also be 3 giveaways over the next 2 weeks this stamp.If you head over to our Facebook Group, find the post about the new Stamp Set, like it and tag a friend, you will be entered into the draws! You will need to join our Facebook Group to enter our draws. Spread the word around the world. This stamp should be fun to colour and create wonderful cards and projects. 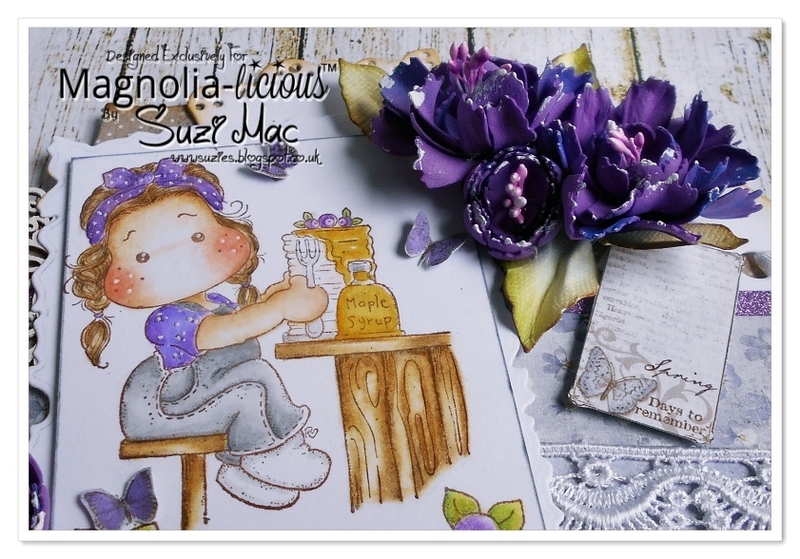 Cheers, Shawn from Magnolia-licious Rubber Stamps and so much more. 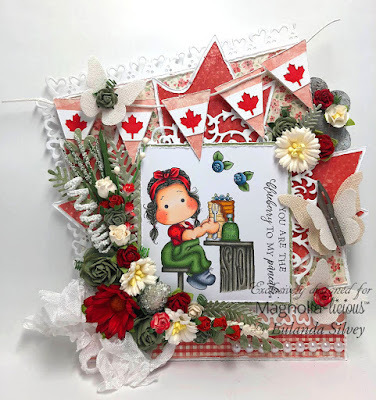 The maple syrup and pancakes really can be anyone’s thing but I also chose to go with a Canadian theme but I will have to admit I wish our flag had more than 2 colors in it. HA HA HA HA!! I was lucky to have the perfect papers for it from Maja Design called "Summertime". Here is my usual bouquet...ok I may have gone a little over the top on this one but for good reason. LOL!! I've used some chalk seam binding that's available in the store as well as soooo many other beautiful colors! Here is a close up of Tilda mowing down on her pancakes, which by the way, I LOVE too!!! Yummay!!! If you were to ever have breakfast with Tilda, what would you ask her? I think my question would be what's her secret to always looking so young. LMBO!!! Here are a few burlap butterflies, one with a Tim Holtz nib in the middle. So there is my contribution for this super cute image!!! I hope you enjoy all the other projects coming your way this week!!! I can't wait to see them myself too but I think the DT has some amazing stuff ready!!! 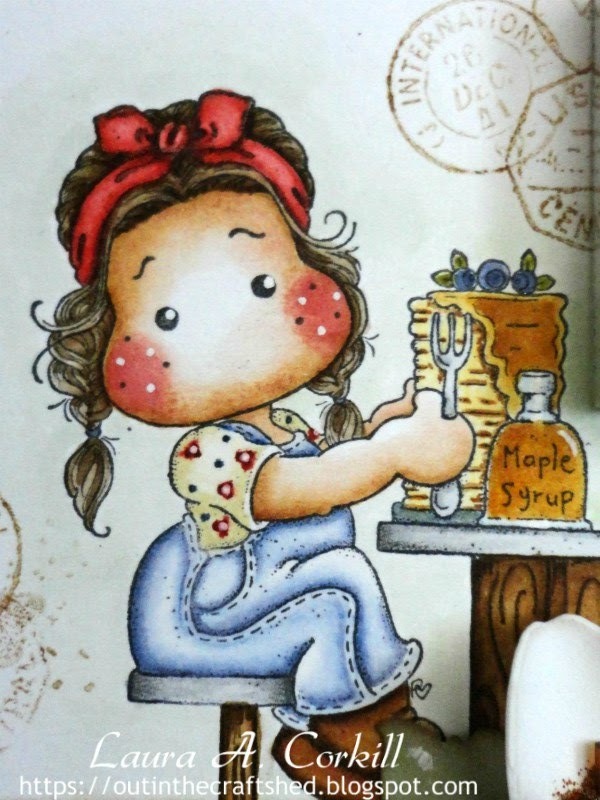 Pancakes, Maple Syrup & Blueberries YUM!!!! Lace and pearls are from my stash. 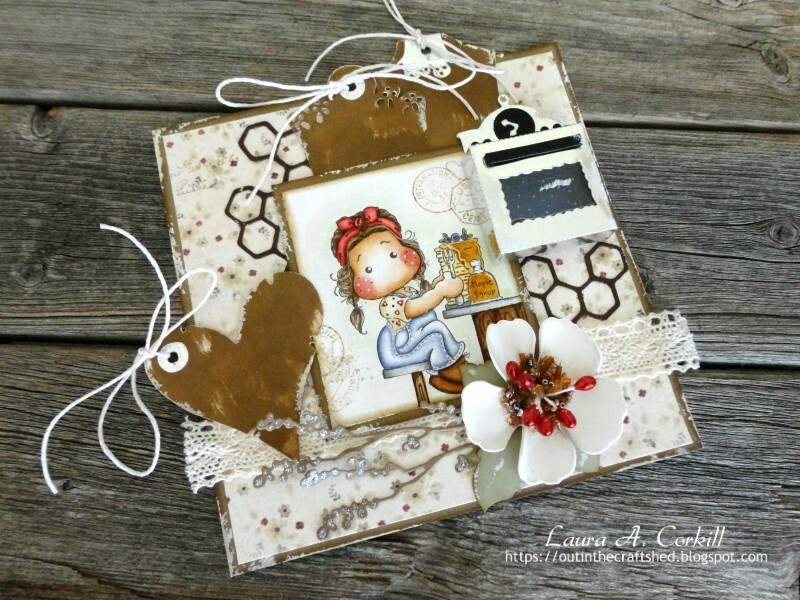 The Theme is Add Flowers to your project !! you enjoyed your stay and do please come back and see me soon. Today I am sharing a post that was done by Claire Helmsworth when she was on our Design Team. Hi everyone, am back with you today with my inspirational post and I hope you all find it interesting. 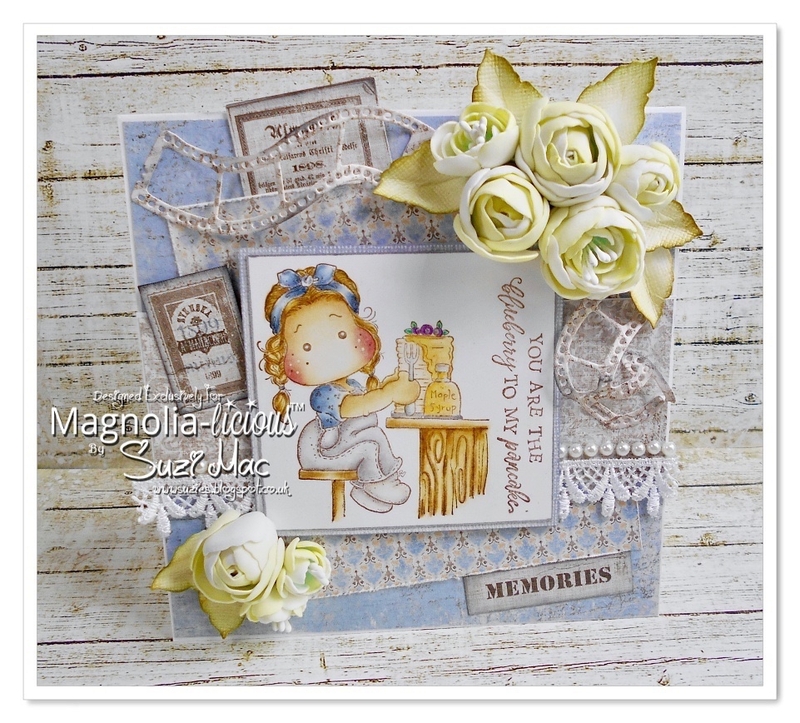 I am basically showing you how I used the stamps and dies from Vintage Box 5. 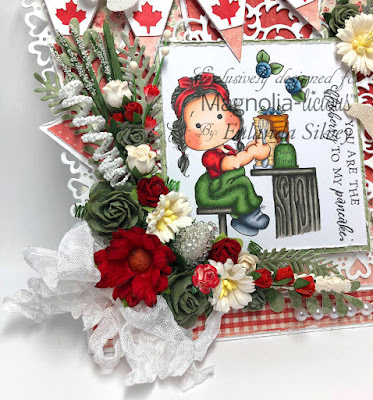 In the video tutorial am going to show you how I used all the dies from Vintage Box 5 and a few of the lovely vintage stamps from the same box as well. 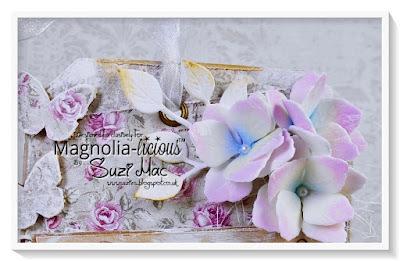 I have used the swedish lace Magnolia doohickey and the paper is from Magnolia. Here you have the link to the video - it's in normal mode so that you can see exactly what I have done. Hello artisan friends and I'm back with a new project! This time I wanted to try a different color with a very special final effect. It gives the feeling of a monochromatic coloring but actually there are many colors that camouflage themselves with the type of cardboard used for this project. I used the Heavenly Tilda stamp, stamping it with black memento on kraft paper and colored with Copic in different shades of gray, taupe and red. The effect is very Wow in my opinion, as it makes the stamp stand out a lot. I simply colored waiting for the color to dry, as coloring looks very dark and lightens as it dries, so from there I started playing with shadows. 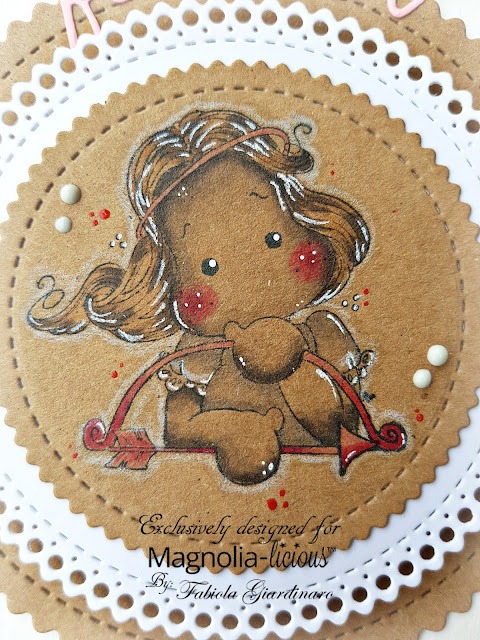 Then I punched, alternately starting from the stamp on craft cardboard and then off white, with Fanciful Circle that I find it fantastic and very versatile both individually and in coupling die-cuts. Then I finally went over the outline with a simple white pencil and gave it a touch of white and red 3D gel pen, ending with the Nuvo crystal drops gloss Oyster Gray. 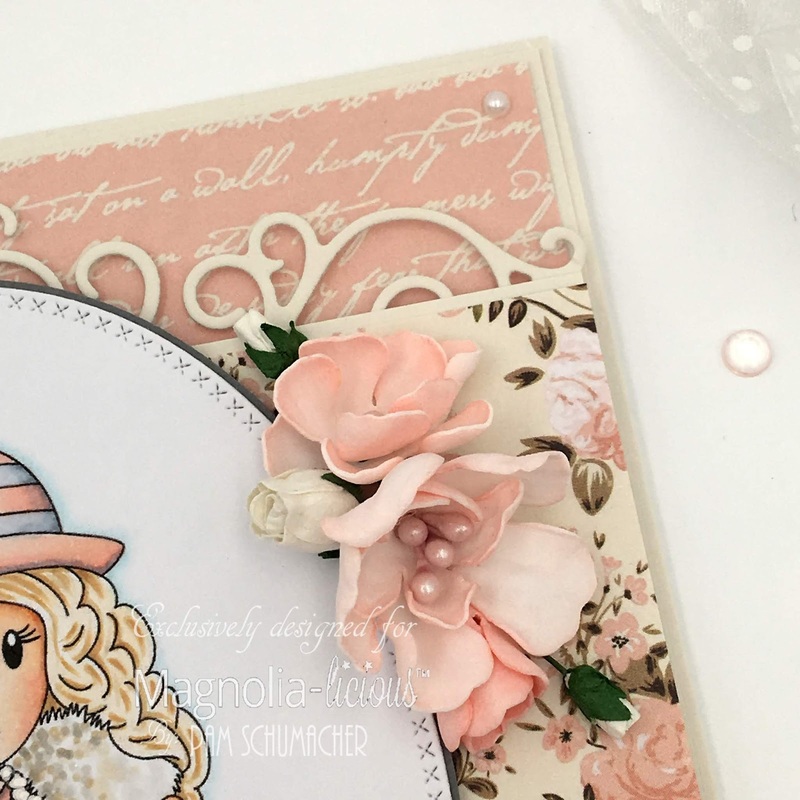 A sentiment never hurts a project by completing it, so I chose the word "Forever" in shades of pink with some 3D red gel touches. Thank you so much for stopping by today and taking a look. 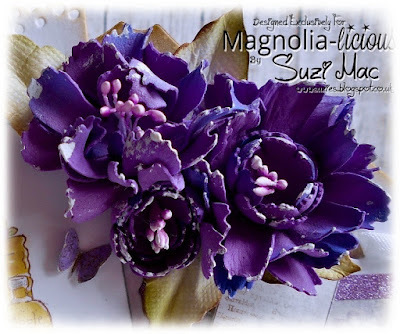 I hope you will join our current challenge here where this month's theme is Flowers. 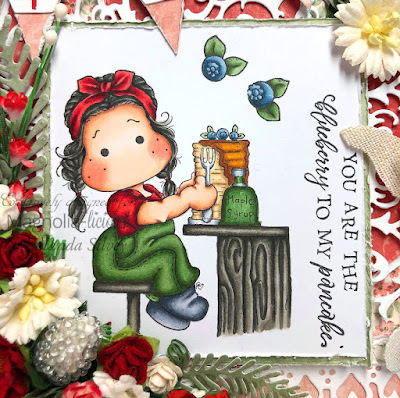 Don't forget that we also sell Polkadoodles, Paper Nest Dolls and Whimsy Stamps that can also be used for our challenges where you can win $ 20.00 to spend on Magnolia-licious Stamps, Dies and So Much More Store. Have a great day and Better Tomorrows! Good Morning My Dear Crafting Friends! Welcome, on this 3rd day of the release of Breakfast At Tilda's. This exclusive stamp was created by Magnolia-licious owner Shawn Mills in collaboration with Pauline of Magnolia Sweden. 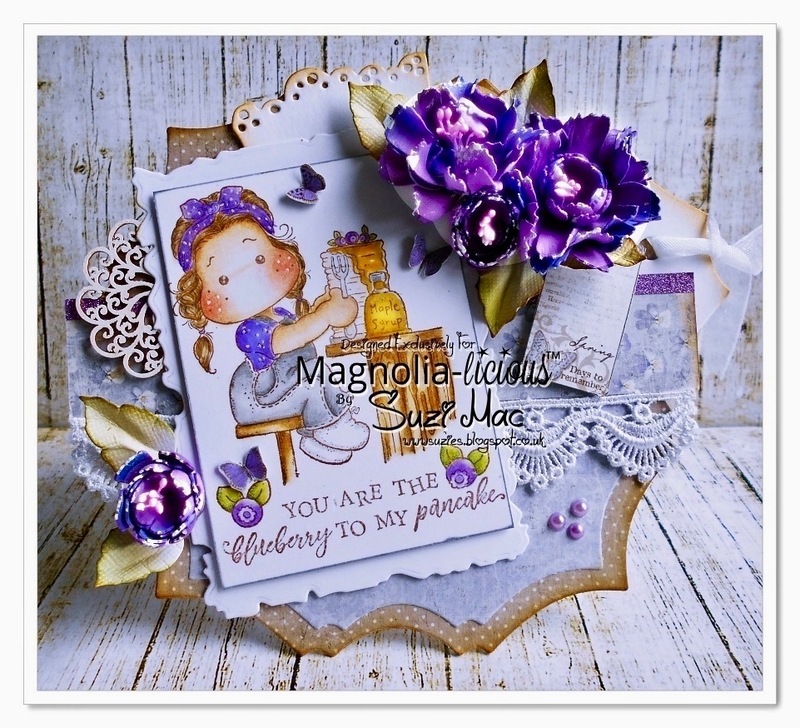 This stamp can ONLY be purchased here at the Magnolia-licious Stamps, Dies and So Much More Store. Shawn wanted this stamp to represent his home country of Canada, where pancakes and maple syrup are served for breakfast, lunch or dinner. This exclusive set comes as a set of four. And here she is... Isn't she gorgeous? 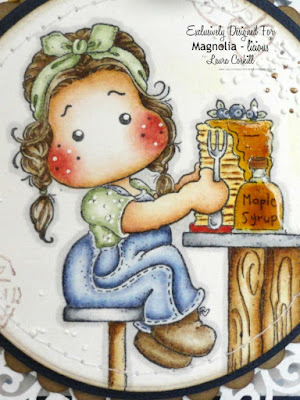 Tilda is eating a delicious stack of blueberry pancakes with maple syrup on this glorious sunny day. Here it is opened up as a double slider card. 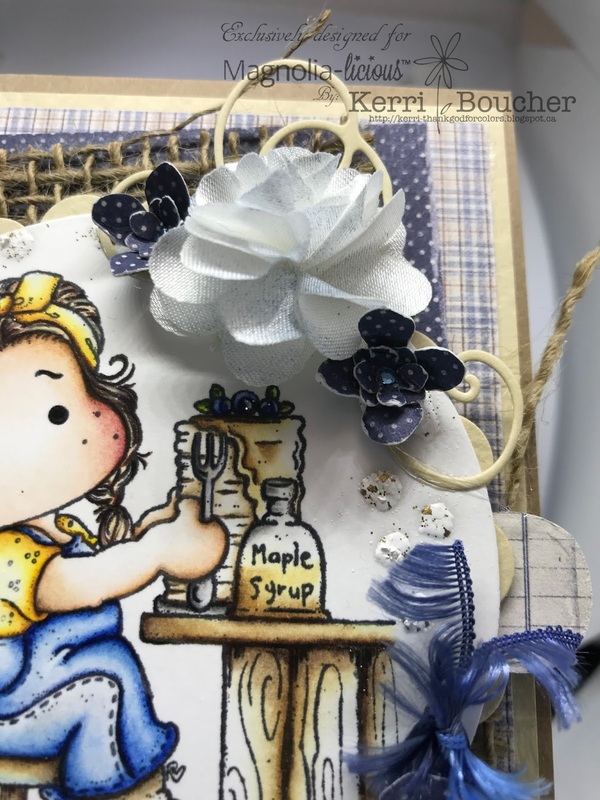 On the right side are the three other stamps that come with this lovely set, the "You Are The Blueberry To My Pancake" sentiment and two delicious blueberries. On the left side I have used the Kitchen from the 2009 A Little Yummy collection. I took away the top of the hutch and added the mixing bowls. 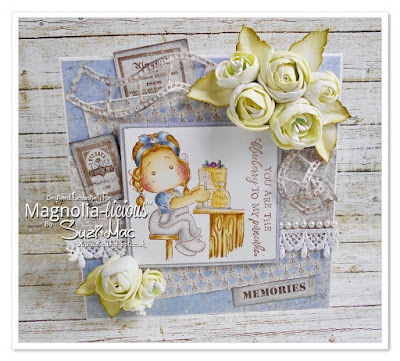 The lovely patterned papers are from Maja Design's, Vintage Romance collection. 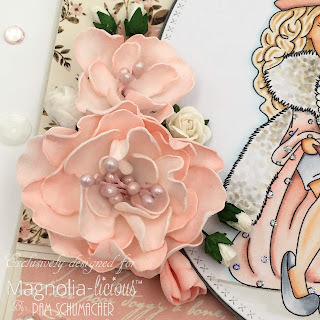 I used Foamiran for the flowers, cut with Magnolia's Rose Leaf die and the flower from My DooHickey Box Club 5 set (Celebration). 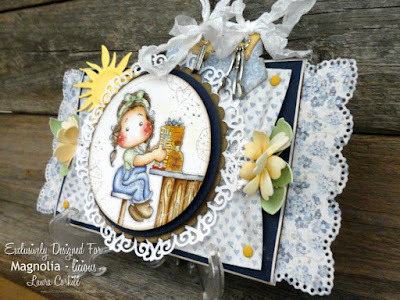 The sun is part of the My DooHickeys Box Club 10 set (Buzz Buzz) and is still available in the store (I love this set, I use it all the time). I die cut the two tags from Magnolia DooHickeys die, Tilda Tags (my faves) and tied them up with Vintage Seam Binding Ribbon, then added some charms that I've had forever. 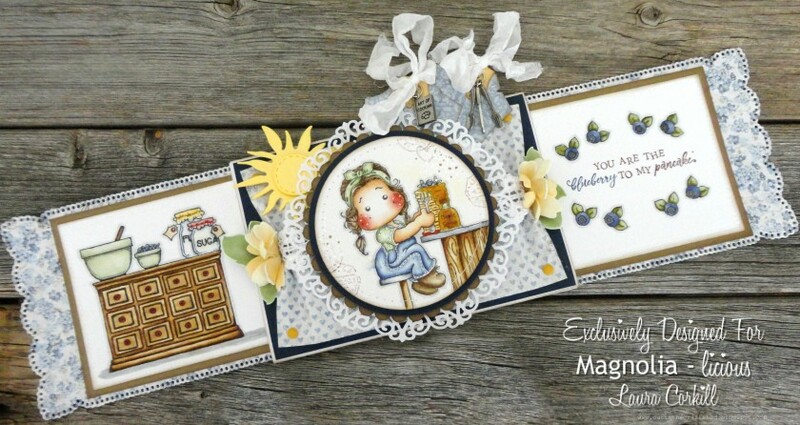 The side, slide out panels are cut with the Recipe Card die from the 2017 Recipe Card collection. Thank you so much for stopping by today and taking a look. 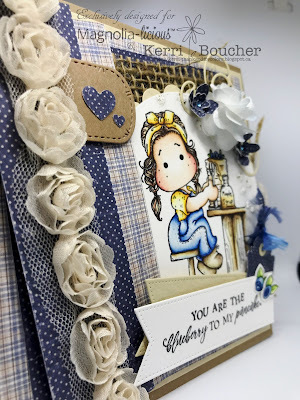 I hope you'll join our current Challenge here where the theme this month is Flowers. Don't forget that we also sell Polkadoodles, Paper Nest Dolls and Whimsy Stamps which can also be used for our challenges where you can win $20.00 to spend in the Magnolia-licious Stamps, Dies and So Much More Store. Breakfast at Tilda's - Exclusivity !!!! 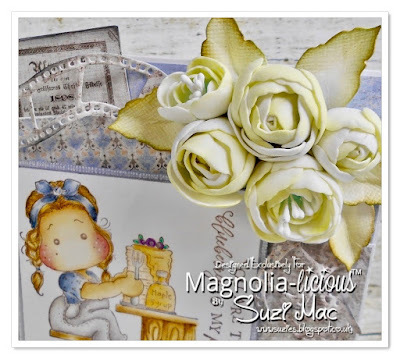 I am very excited to share an exclusive stamp made from Magnolia for the store. This was something that I have always wanted to do for all Magnolia lovers around the world. you will be entered into the draws! You will need to join our Facebook Group to enter our draws. 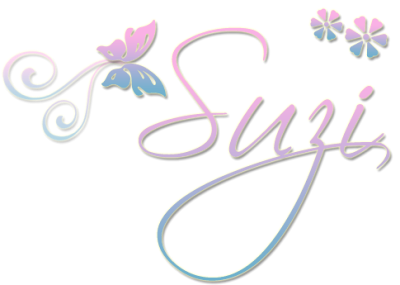 Good morning my dear friends, I'm here to share some very exciting news with you today!!! which has been designed by Shawn Mills (owner) in collaboration with Magnolia Sweden!!! syrup and is a staple breakfast/brunch/supper dish of Canada. the store. 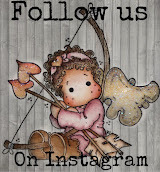 I will as always link the items for you at the bottom of my post. Here is close up of those lush flowers and paper leaves. Good morning to all of my crafty friends! 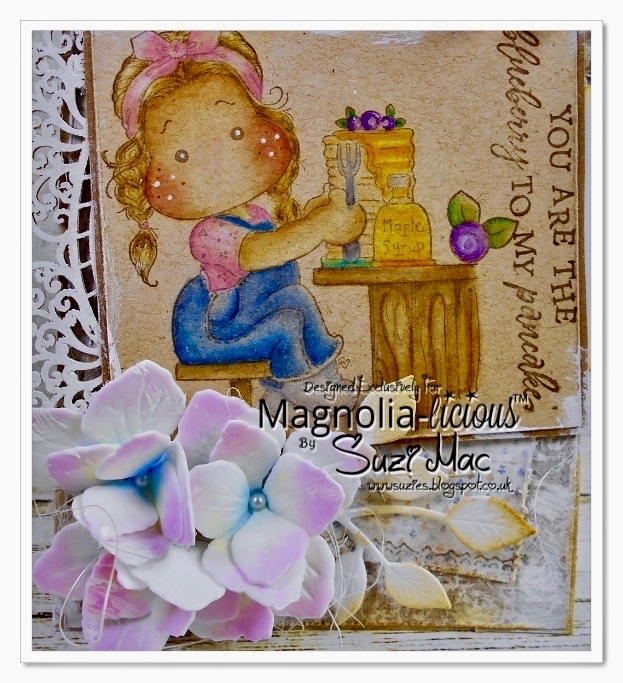 Today I am sharing a STAMP with you that is EXCLUSIVE to MAGNOLIA-LICIOUS. Now this stamp truly embodies me.. Without further ado I want you to meet BREAKFAST AT TILDA'S.. Awesome or what BLUEBERRY PANCAKES, MAPLE SYRUP!! Well I hope you like my creations ! 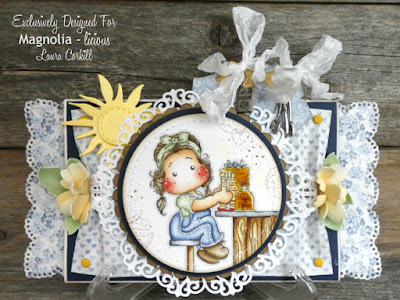 Breakfast at Tilda's Stamp Set - You can find the stamp linked here! 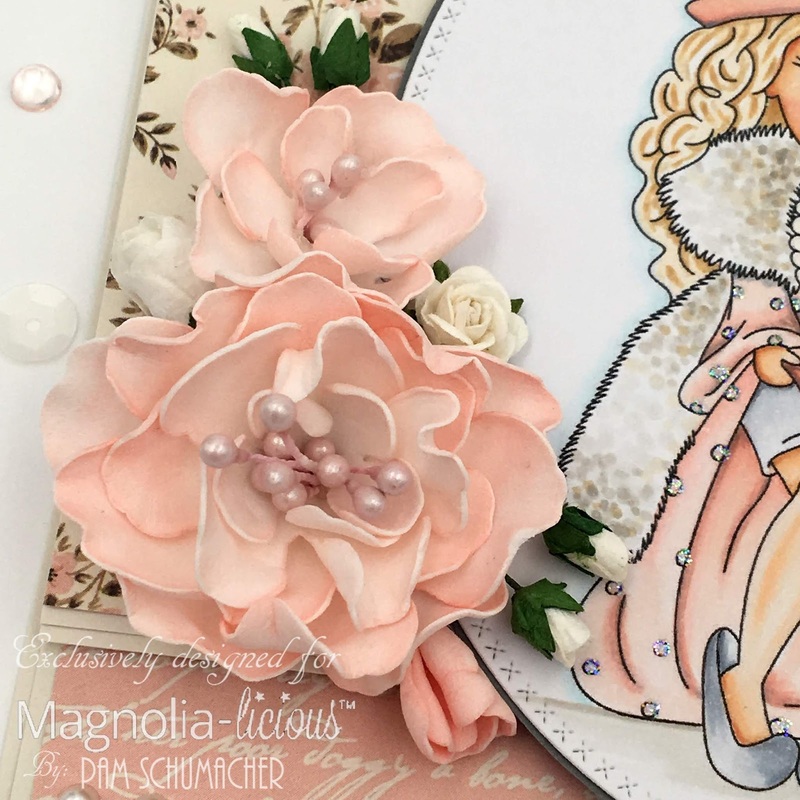 April's Challenge and Last Months Winner!